House Speaker Paul Ryan (R-Wisc.) on Thursday said he has "no reason to dispute" the official Hurricane Maria death toll in Puerto Rico, hours after President Donald Trumpaccused Democrats of fabricating the numbers. 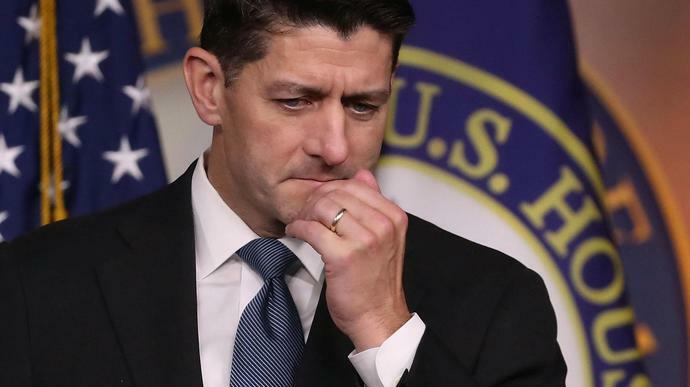 Despite the federal government's widely panned response to the devastating storm, Ryan on Thursday claimed no one could be blamed for the nearly 3,000 lives lost in the aftermath of Maria. "Casualties don't make a person look bad," Ryan told reporters. "This was a horrible storm." He added: "Casualties mounted for a long time. ... This is a devastating storm that hit an isolated island. And that's really no one's fault. It's just what happened." Trump was met with swift backlash earlier Thursday when he denied nearly 3,000 people died after back-to-back hurricanes ravaged Puerto Rico in September 2017, as estimated by a government-commissioned study last month. Citing no evidence, he claimed Democrats made up the numbers to make him "look as bad as possible." Puerto Rican Gov. Ricardo Rosselló raised the official death toll from 64 to 2,975 following the release of a study that was conducted by researchers at George Washington University's Milken Institute School of Public Health. "That caused a number of issues," Lynn Goldman, dean of the Milken Institute, told USA Today last month. "It's fairly striking that you have so many households without electricity for so long. That's unusual in the U.S. after a disaster." Sen. Lindsey Graham (R-S.C.) said Thursday that he would like to see a congressional hearing into the federal government's response to Maria. "There's no doubt in my mind that mistakes were made," Graham told reporters. "If I were in the committees of jurisdiction I'd like to have a hearing on Puerto Rico. How many people died? Where did the response fall short locally? Where did it fall short federally? And what can we learn here?" Eighty percent of Puerto Ricans rate Trump's response to Hurricane Maria negatively, according to a Washington Post-Kaiser Family Foundation poll published Wednesday. San Juan Mayor Carmen Yulín Cruz was one of the most vocal critics of the federal government's rescue and recovery efforts. She repeatedly begged the president during TV appearances to send additional aid to Puerto Rico. "People died on your watch," Cruz tweeted in response to Trump's death denial Thursday. "YOUR LACK OF RESPECT IS APPALLING!" Still, as Hurricane Florence bears down on the Carolinas, Trump has described the federal government's response to the storms in Puerto Rico as "unappreciated" and an "unsung success."